NEW YORK, New York March, 20　-- World Baseball Softball Confederation (WBSC) Baseball World Cup® umpire Po Chun Liu was awarded the International Olympic Committee (IOC) Women and Sport World Trophy, the highest distinction that the IOC bestows in the category, on Tuesday (19 March) at a dedicated awards ceremony on the side-lines of the Commission on the Status of Women (CSW) at the United Nations (UN) headquarters in New York City, USA. Liu, a native of Chinese Taipei, was given the IOC World Trophy as part of six "change-makers" advancing women and girls in and through sport," the IOC said, with five others earning Continental Trophies. Liu, known as the "Mother of Women's Baseball" in Chinese Taipei, made her World Cup debut as an umpire at WBSC Women's Baseball World Cup 2010 in Maracay, Venezuela, and was featured in Forbes' 2018 list of the Most Powerful Women in International Sports. She most recently was an umpire at the WBSC Women's Baseball World Cup 2018 in Viera, Florida, USA. "It's our responsibility to empower girls and women so they'll realise their full potential and take charge of their lives," Liu said in her acceptance speech. "To help a girl is to help a family." She began as a volunteer at the youth level, becoming the first female baseball umpire in Chinese Taipei. A full-time social worker, Liu is dedicated to creating opportunities for girls and women to be better represented in sport, organising baseball clinics and workshops in her homeland. Liu is determined to help "strike out gender discrimination". 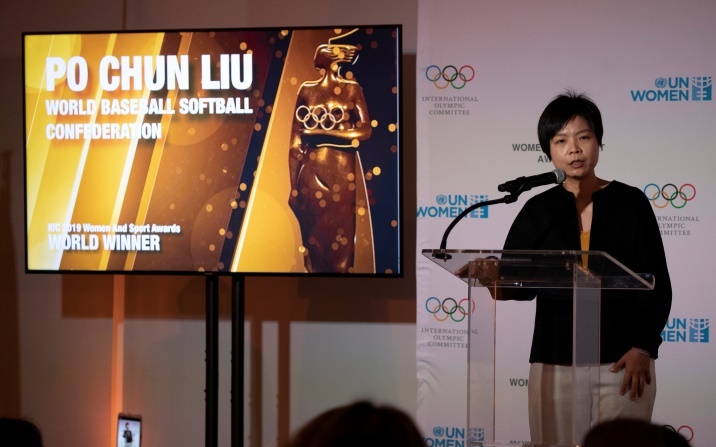 WBSC Secretary General Low said: "This prestigious honour reflects Ms. Liu's positive impact on gender equality and breaking down stereotypes in sports, using baseball as a global platform." WBSC Vice President and IOC Member Allen said: "Liu is a role model and source of inspiration in her homeland, for the sport of baseball, and now for the whole Olympic Movement, as she helps redefine women's roles in sport and paves the way to unlock opportunities and a more level playing field for future generations of girls and women in sport." IOC President Thomas Bach released the following statement from the UN headquarters: "The Women and Sport Awards are very important because these personalities we are honouring have shown what can be achieved by empowering women and girls through sport. "Supporting such champions for women's empowerment is essential in our overall commitment to gender equality. "In today's world, no organisation or country can afford to let half of the population be left behind - either in sport or in society." Introduced in 2000, the IOC Women and Sport Awards are given to individuals or organisations who have made remarkable contributions to the development, encouragement and reinforcement of women's and girls' participation in sport, including at the administration and leadership levels.